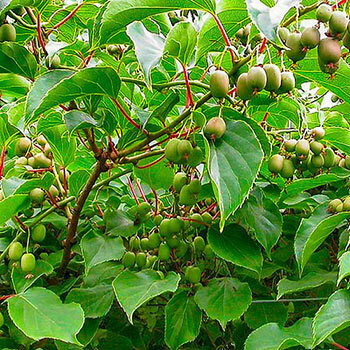 The little grape-size kiwis produced by these vines aren't your grocery store varieties. 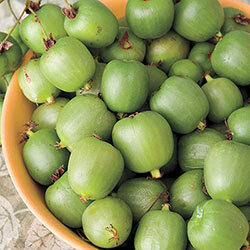 These little fruits are smooth, sweet and you can eat the whole thing instead of cutting off the skin. The plant is also hardy up to zone 4, so Northern gardeners can get a taste of the tropics as well. The female vine requires a male vine to bear fruit, so they come in a set. The male vine is also ornamentally attractive with dazzling variegated foliage. We're shipping the Hardy Kiwi Pair right now, more established and ready to put on a show. Planting Instructions: Dig a hole twice the size of the pot plant is in. Plant at same depth as it is in the pot.